Is your marketing team dealing with constant fire drills? Are they constantly bombarded with random work requests? With all of the chaos of marketing work, it’s time for some guidance. Finding a tool that can reduce chaos at work is critical to marketing success. The trick is choosing the right tool that will work for you and your team. 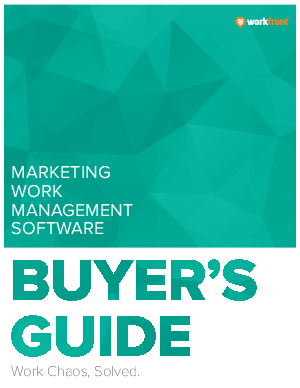 Use this buyer’s guide to help you consider important features when investing in a marketing work management tool to help your marketing team work more efficiently.